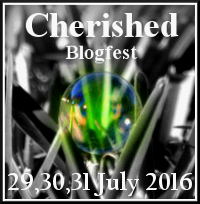 A year go, a small group of bloggers announced the first Cherished Blogfest, held the last weekend of July, 2015. This group asked bloggers to share something they cherish in whatever medium(s) they choose – with writing or poetry (limited to 500 words), photography, art medium, etc. During the weekend of July 24-25-26, 2015, well over one hundred bloggers, including myself, participated and shared their cherished items and personal stories. It was a great way to meet new bloggers and peruse some very awesome and touching posts. The weekend of July 29-30-31 will be the second year of Cherished Blogfest, organized by Dan Antion over at No Facilities. I’ve joined this year’s small blogging group in promoting the Blogfest and it is our hope that you will join in helping us spread the word as well. Joining in on a blogfest is fun and easy. All you have to do is write a blog post, publish it at the designated time, then fill out a Linky list thingie and read a few posts. You can do it. You know you want to. Visit the home of the 2016 Cherished Blogfest. Sign up today, check on the process, and start thinking about the “thing” you cherish most in your life. You have a month to come up with a post. Copy the badge and place it on your sidebar, and help us advocate and publicize the blogfest on social media. Please use hashtag #CBF16. We truly had fun with last year’s Cherished Blogfest. It is our hope that participants from last year will be back to share another cherished story and that those who didn’t will be a part of this year’s ride. Thanks in advance for participating and we’re looking forward to your posts. Thanks for spreading the word, Mary. This is going to be fun. My pleasure, Dan. I’m excited to see how many people participate this year. I knew I could count on you, Joanne! I’ve come here thanks to Damyanti’s Twitter shout out. Thanks for the information. Sounds exciting! It is exciting. Looking forward to reading your post. Will you think me weird (well, you know, weirder than you already do) if I tell you that as soon as I read “start thinking about the “thing” you cherish most in your life”, I started to cry? Seriously, sometimes I wonder if I have some Hoover Dam of unshed tears inside that splash over the dam wall every time something gets a bit touchy. I’ll take it as a sign I may need to participate, eh? Honey, we are both weirdos. I cry when I hear the US national anthem or listen to my favorite Christian song or when they kill off one of my favorite TV show characters. Some of us are wired that way…we don’t let stoicism get in the way of our emotions and we feel all of them deeply. Yes, I believe you need to join in and share the tears of the thing you cherish most. Hi. Thanks for co-hosting the blogfest. Looking forward to your post.